Great Falls High’s Liz Klinker shoots a layup in Thursday’s game against Havre High. The No. 3 Great Falls High girls’ basketball team cruised to a 54-31 nonconference win over Havre on Thursday night. That makes three in a row for the Bison (10-2), who have lost twice to Helena Capital this season. Thursday, GFH used aggressive defense to force 21 turnovers en route to the easy win. 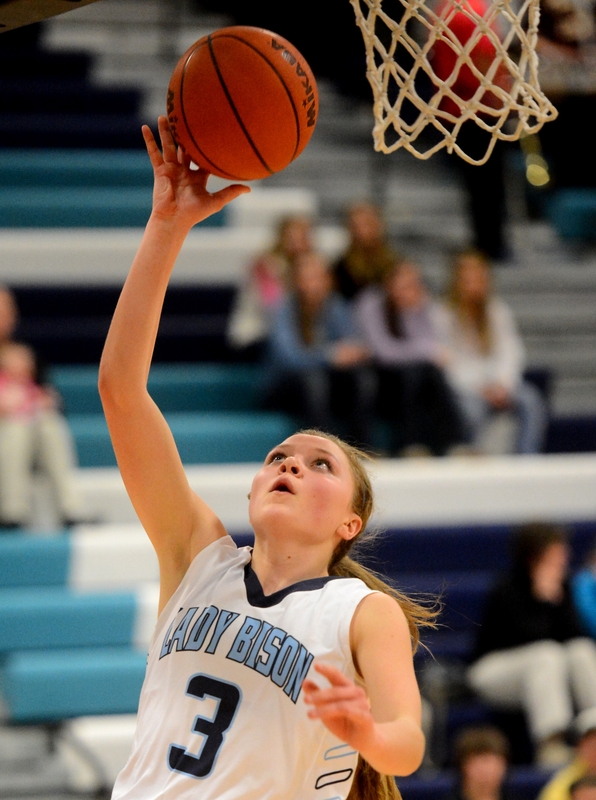 The Bison moved the ball very well, shredding Havre’s zone defense. “They really understand what we’re trying to do,” Dart said. “We talked about passing angles and especially against the zone, the quicker the ball moves, the defense is always going to be a second behind. The Bison have solid depth as evidenced by the fact that 11 players saw the court for them Thursday. Dart said that shows not only during games, but also during practice. Next up for the Bison is a trip to Butte, which topped C.M. Russell High Thursday in the Electric City. Meanwhile, the GFH and CMR boys’ teams were each victorious. Joey Marzion scored 29 for the Rustlers in their victory at Butte.